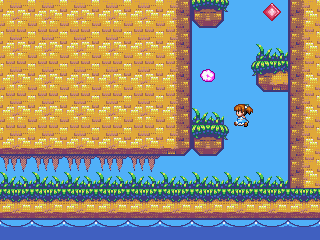 GpAlice is a platform game, playable on the GP32 console. on the 5th and 6th April 2014 at "Congis sur Thérouanne", France. Alice is in wonderland and she must find the white rabbit hole. 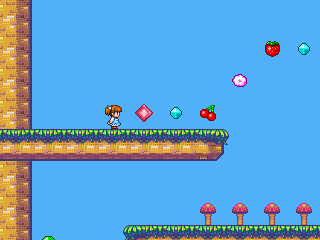 She can collect fruits and gems, but she must avoid the peaks and be careful with the mushrooms ! If she jumps on a tiny mushroom she will become tiny, and won't be able to jump too high. Jumping on a big mushroom will get its normal size back ! The Contest Rules required a 2 players mode, but because of the lack of 2 GPLink, I couldn't do a real 2 players mode. That's why, Player 1 plays first, then Player 2, and in the end, the game tell who finished the level faster !